Story: Generations, Part 3: Solomon Grundy Goes Hollywood! Summary: It's Christmas Eve in Gotham City, and Power Girl starts to regain consciousness following the Ultra-Humanite's cerebral assault on the Infinitors. 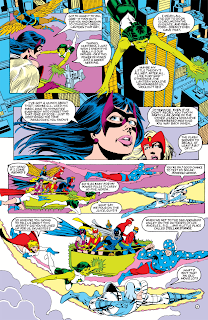 She finds most of the Infinitors missing except for the Huntress and the Star-Spangled Kid, whom she decides to wake up by taking them for a spin around Gotham. When they return to her flat, the three young JSAers try to figure out what happened to their missing new comrades, only for them to return on their own within seconds of opening dialogue. Everyone is confused as hell until Brainwave Jr. fills everyone in on what happened. It turned out the present Ultra-Humanite managed to get in contact with a past version of himself from the World War II era from the limbo dimension and collaborated on a plan to wipe out the Justice Society. Both rationalised that the best way to achieve this was by transplanting the present Infinitors to the past to kill their parents, effectively undoing all of their exploits of the last four decades, including the imprisonment of the Secret Society of Super Villains into the limbo dimension. 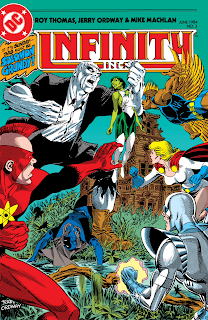 The Infinitors were at some point (mysteriously) released from the Ultra-Humanite's control and fought alongside their parents in order to return to their time. Though they've successfully returned to the year 1984, one question for them remained: how come their parents didn't remember seeing them in 1942 or recognised them when they disrupted an emergency Justice Society meeting hours earlier? In Los Angeles, the Infinitors end up in an old Hollywood studio the Kid inherited called Stellar Studios, which he also wants to make their main headquarters. While talking about his inheritance, the Kid reveals that his adopted sister, Merry Pemberton, was known as 'The Girl of a Thousand Gimmicks,' who turns out to be the Brainwave Jr's mother (she actually reproduced with the Brainwave?). The rest of the Infinitors decide to leave Brainwave Jr and the Star-Spangled Kid to talk by touring the premises. 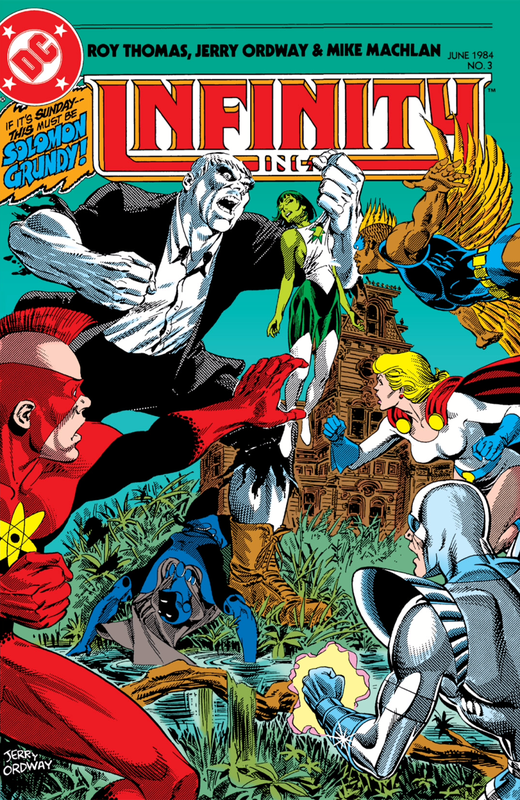 Along the way, they come across Solomon Grundy who has been summoned there by a voice in his head, presumably the same voice that sent the Infinitors to fight their parents in 1942: the Ultra-Humanite. The Infinitors fight and manage to subdue Grundy, but soon realise the larger scale of the Ultra-Humanite's plan. Out in the midwest, the Justice Society heroes arrive at the location Superman summoned them to. They are confused as to why Superman isn't there to meet with them, and decide to go inside the cave they've arrived at in hopes of finding him there. Instead a body of water comes rushing through the cave, drowning them all. As soon as the water recedes, Superman appears and reveals that he had setup a trap for his comrades, effectively showing that he has been brainwashed. Review: One thing I've gotten accustomed to reading Roy Thomas comics is his penchant for complex storytelling. His narratives are always big in scale and he always manages to create sub story arcs that interweave into the much larger narrative without losing focus. That is exactly what he does in the third instalment of Infinity Inc, Vol 01. Since issue #1, Thomas established right away who 'the big bad' was and has been building his narrative on that central villain. At the same time that he's been unfolding the Ultra-Humanite's plan for escaping the limbo dimension, he's also been building up the second generation of superheroes (the Infinitors) to take on the responsibilities of the older, more experienced Justice Society heroes once they've been taken out of commission in a trap that was setup by a brain-washed Superman. A major recurring theme throughout this series is whether or not a younger generation of heroes has what it takes to succeed the older, more seasoned Justice Society. 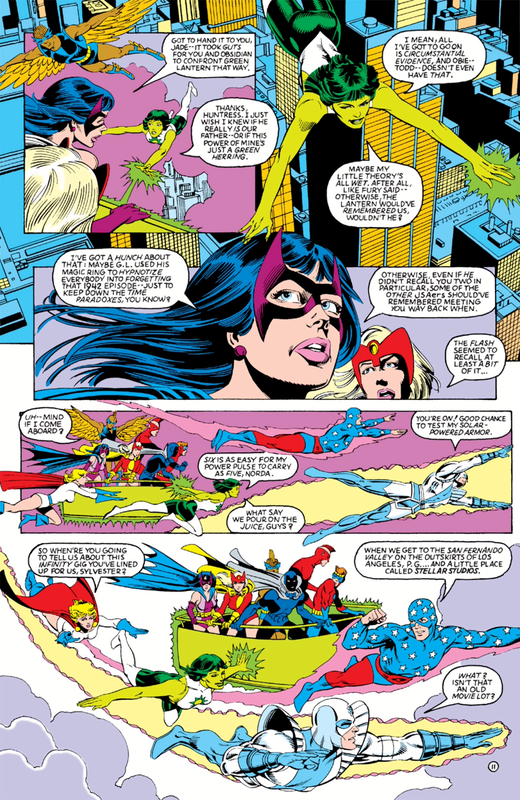 It is a question that is asked by both groups of heroes with both groups acknowledging the younger heroes' lack of experience as a major drawback to allowing them to take on major threats like the Secret Society of Super Villains. The latter concern is especially validated in this issue when the Ultra-Humanite succeeds in brainwashing the Infinitors into fighting their parents in the 1940s when they were in their prime. Knowing that they have to prove themselves worthy of their names and identities as superheroes, the Infinitors take it upon themselves to confront the Secret Society of Super Villains on their own. Another way that theme is explored is through the characterisation of the individual characters themselves. One thing that they all have in common is the fact that they are all very confident in their abilities as superheroes, but they also show how much more growing up they have left to do. This is most visible when the Infinitors are juxtaposed alongside the younger Justice Society members: Huntress, Power Girl, and the Star-Spangled Kid. Though relatively more experienced than the Infinitors who are about to embark on their first real case, they are in fact still learning the craft themselves. This was most notable in their fight against Solomon Grundy when they demonstrated they didn't know how to best contain the monster until they all worked together to contain him. For more specific examples, Power Girl shows in this issue that she is still very impulsive in the way that she handles dangerous villains and doesn't have a penchant for using strategy. She's a very physical young woman, which is how villains are sometimes able to get the upper hand on her. Though the Huntress learnt the hard way (from the first time that she encountered Grundy) that a villain like Grundy should be taken seriously and can't be underestimated just because he sounds dumb, she also doesn't really offer advice on how to best take him down. All she knows how to do is slow him down until they can get help from the more experienced Justice Society. Even the Star-Spangled Kid wasn't much help in the fight against Grundy, except to slow him down and have Jade contain him inside a bubble powered by her power pulse. In reality, the only advantage the younger Justice Society heroes had on the infinitors was that they knew only enough to inform them that the villains are always more dangerous than they look. They've only fought in the Justice Society long enough to learn how to work as a team to take down more dangerous threats, but haven't fought long enough on their own to really learn how to contain these same dangerous villains on their own. 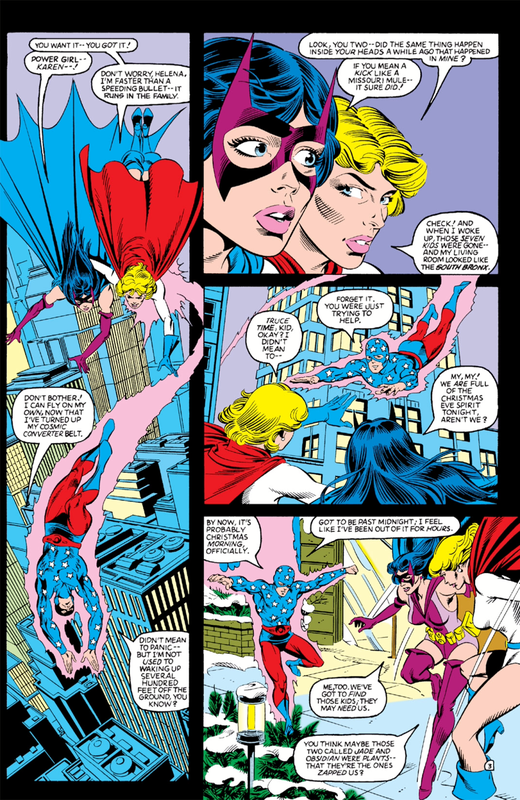 Even when Huntress and Power Girl fought together to take on a villain like the Thinker, they made a lot of mistakes before they succeeded in taking him down. A lot of it involved improvisation by the Huntress, which is the same thing that happened in the Infinitors' fight against Grundy. They all improvised before they figured out a way to contain him. On the flip side of the coin, Thomas also shows that age and experience doesn't always mean that a hero will know what to do in every situation and are still susceptible to making mistakes. This is most evident in the final pages of this issue when the older Justice Society heroes are shown unquestionably answering a call from Superman knowing that the reason they were holding a meeting in the first place was to address the potential escape of the Secret Society of Super Villains. Despite being more experienced and being used to seeing their friends brainwashed over and over again by this particular group of villains, it still never occurs to them they could be walking into a trap when they realise Superman isn't there to meet them at the site that they said to meet him in. They very easily fell into the trap. On the whole, Thomas excels best when he presents the Earth-2 heroes as flawed human beings while at the same time maintaining the spirit of the Golden Age continuity, complete with some of the silliness that comes with it. He succeeds in presenting the villains as dangerous and calculating, while at the same time embracing the conceptual silliness of those characters. He succeeds in maintaining a balance between the two things without falling into one extreme or the other as many modern writers tend to do. He also presents the Earth-2 heroes as powerful, but not infallible, and this is all across the board. Ultimately when he writes the Earth-2 heroes, he writes them as human beings first and as powerful entities second. He writes them as as people who happen to wear costumes (and in some cases happen to have powers) when they fight villains like the Secret Society, not as gods who happen to look like people and resolve all of their problems through violent force. It is this human element that ultimately makes this comic and many other pre-Crisis Earth-2 comics enjoyable to read. A nice balance is consistently struck between grounding the characters in ways that make them relatable to readers about also leave a tiny bit of room for the power fantasy to be fulfilled with these characters. There is no such thing as extreme storytelling with Infinity Inc and the stories are still full of heart.